​As wildfires burned through California’s Napa and Sonoma Counties in late 2017, Sandy Cesario was forced to evacuate her home and all she knew. Like many of the 5,000 residents of her small Calistoga town, she took refuge at one of the county’s evacuation centers filled with uncertainty. That was the last place she expected to see her personal doctor. “Right now my throat’s all filled with smoke and real raspy and deeper than normal, but other than that, we’ve been taken care of like we’re kings and queens,” Cesario said. 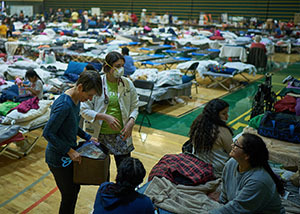 Amidst the chaos caused by this natural disaster, OLE Health’s staff, along with several other Federally Qualified Health Centers (FQHC), immediately sprung into action, working tirelessly to ensure that their current patients didn’t have any gaps in their care while simultaneously providing immediate critical care to the greater community, treating everyone that they could at the county’s evacuation centers. OLE Health is the only FQHC in Napa County, with five locations throughout the surrounding area. OLE serves 1 in 4 children and 1 in 6 adults in the area. They knew that their patients – Napa’s working class, a majority of whom are uninsured or underinsured, who rely on OLE for affordable health care – would be uniquely affected by the fires, disrupting their treatment and access to medication. Dr. Colleen Townsend was one of OLE Health’s staff members who rallied to provide health care to her community during the California wildfires. “At OLE Health, we’re a community health center, so we provide primary medical care to people of all walks of life, insured or not insured, or insured through federal programs or state programs. We often see patients who have no insurance. Those patients often have difficulty accessing care when the services are interrupted,” Colleen Townsend, a family physician at OLE, said as she treated patients at a busy evacuation center during the October fires. During the first week of the fires, OLE treated around 700 patients like Cesario. There was the immediate care they provided, for the people who had broken ankles from running from the fires or conditions related to poor air quality. Many of the grape pickers at River Ranch Farmworker Center, where OLE provides outreach care, continued working outside during the fires, exposing them to dangerously polluted air. However, one of their biggest successes was filling the gap for people with chronic conditions whose health depends on access to their life-saving medications. As local residents fled the fires, they were forced to temporarily relocate, and medications would have been prohibitively expensive at other health facilities and pharmacies. To fill the gap, they teamed up with volunteers from nearby Touro University to provide free rides to pharmacies that remained open during the fires so that patients with conditions like diabetes could acquire the medications they needed. Many residents, who either lost proof of their insurance or didn’t have insurance, received gift cards to local pharmacies from OLE. OLE’s efforts didn’t stop when the fires were finally contained weeks later. Local residents were still grappling with the emotional aftershocks of the wildfires, so OLE provided mental health care resources for victims. They also walked patients through receiving insurance through Covered California even if their information had been lost in the fire. Additionally, since many of OLE’s patients are undocumented, they also guided them through the process of receiving FEMA funds specifically for immigrants. Medical staff wait to serve patients at a wildfire evacuation center in Northern California. OLE wasn’t the only FQHC that did exemplary work to serve those affected by the fires. Petaluma Health Center opened its doors to offer walk-in appointments to everyone that needed care – not just its usual patients – and opened on Sundays, when it is typically closed. During the early days of the fire, they saw hundreds of extra patients. 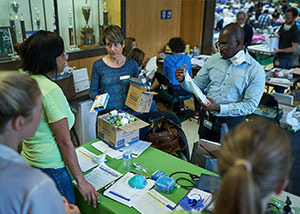 Sonoma Valley Community Health Center also provided immediate care and resources like face masks and charging stations for fire victims, and later partnered with the University of California, San Francisco to offer their patients crisis counseling specifically tailored for fire victims. They also helped patients apply for benefits like disaster-related Supplemental Nutrition Assistance Program benefits under CalFresh and short-term disability. Too often, vulnerable populations receive sub-par health care because they can’t afford the high costs of quality care. FQHCs like OLE, Petaluma HC, and Sonoma Valley CHC do a great deal to serve their patients, both in everyday and emergency situations. 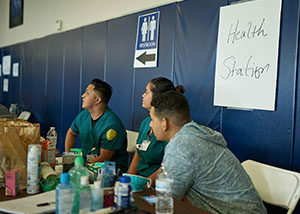 Many offer not just health care, but dental care, and mental health services, as well as connections to local agencies that providing affordable housing, fresh produce, and legal help with their immigration and citizenship needs. OLE Health and other FQHCs went beyond their typical duties to provide quality health services to all members of the local community. Capital Impact Partners is well acquainted with the work of organizations like these, work that often goes above and beyond the norm. Their hard work providing care to all members of their communities is why Capital Impact has partnered with health centers like these, providing the vital capital and capacity building support they’ve needed to grow and expand. “The types of services that a health center provides are difficult to access either from private physicians or from emergency rooms, which are much more costly. The full range of services, disease care, as well as becoming a real medical home for a patient, are important to us,” said Scott Sporte, Capital Impact Partners’ Chief Lending Officer. While FQHCs play an essential role in underserved areas, they struggle for financing to support their programs. Many traditional lenders see FQHCs and other community health centers as risky investments. Capital Impact has financed more than half of the FQHCs in California through programs including the CPCA Ventures Program, the New Market Tax Credit, and the Healthier California Fund. Capital Impact invests in FQHCs nationwide because they are key to improving health care outcomes for vulnerable communities. Without the invaluable safety net that these FQHCs provide, the health of individuals in many underserved communities would go un-addressed, and disasters like the Northern California fires could have been even more devastating to low-income patients. To learn more about how Capital Impact can support your FQHC, get in touch with our staff. To learn more about our work with OLE Health, read this story.